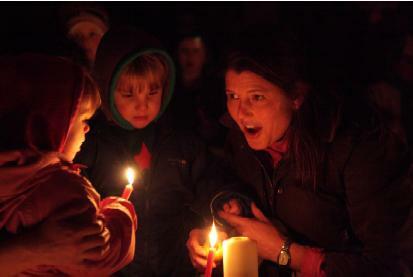 Families from Grindleford Pre-School and Hathersage Playgroup got together recently to celebrate the start of the Christmas season at a magical evening of candlelight and carols at the National Trust’s Longshaw Estate. Undeterred by the ferocious wind and rain, children and their families followed a winding path of brightly coloured lanterns through woodland to the Estate’s Moorlands Centre where staff welcomed them in with cheery carols. The children were invited to walk through an advent spiral of winter greenery and add a candle to the display, until the room was lit by flickering candle light. We were all delighted to see so many entranced little faces! We’ve been working closely with Hathersage Playgroup since our new committee took over in September 2012, and it was a delight to be able to share this festival with them. The event ended with a hearty supper for all provided by the Estate’s popular café. This entry was posted in Lantern Walk photos! on January 16, 2013 by grindlefordandeyamplaygroup.